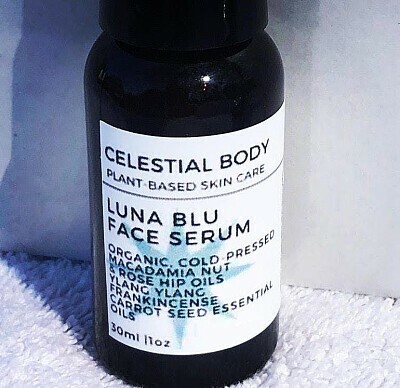 Macadamia Nut Oil, Carrot Seed Oil, Rosehip Oil and Frankincense all go into this deep penetrating organic face serum. Carrot seed oil rejuvenates skin with Vitamin C, frankincense essential oil for its anti-aging properties, rose hip oil for omega 3s, 9s and 6s and hydration. Great for scars, abrasions, blisters and cuts. Deeply healing and nourishing Use before bed, after washing your face.During the day, can be used in the sun. Carrot seed oil is a natural SPF 40.